Pretty Silver Shamrock Studs with lovely silver Shamrocks and pretty Green Crystals set within it. They are approx 3/4cm high by 1 cm wide. PLEASE NOTE photo is edited from earrings as currently have no image. Matching Necklace & Pendants also in stock! Pretty Silver Shamrock Studs. 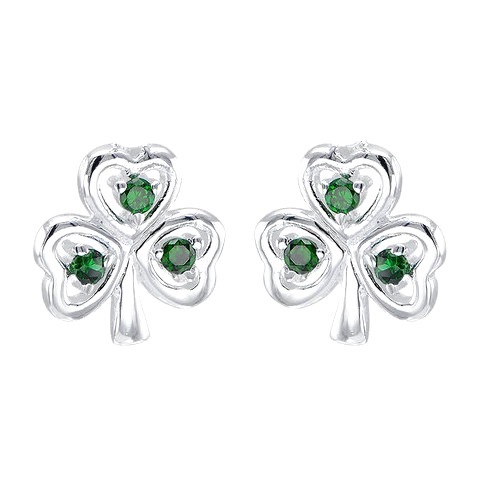 This Pretty Silver Shamrock Studs have lovely silver Shamrocks with pretty Green Crystals set within it. They are approx 3/4cm high by 1 cm wide. PLEASE NOTE photo is edited from earrings as currently have no image. Matching Necklace & Pendants also in stock! This website is strictly for approved Wholesale customers only, if you are looking to buy these Pretty Silver Shamrock Studs from a retail store, please visit Shooting Star.